This week, as I’ve been out walking the dog, I couldn’t help but notice a neighbor down the street with a tree full of cherries growing riper … and riper. I remembered my vow last year to ask for fruit that appeared to be going to waste, so I knocked on the door on Tuesday. Nobody was home, so I left a note; and the next day on my walk, I saw the door was open, so I went and rang the bell. 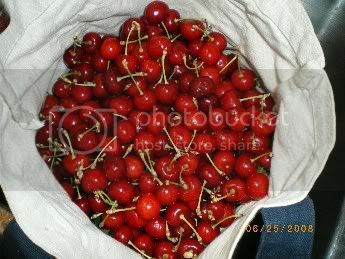 The home is a rental, and the tenant said I could take all the cherries I wanted. Hooray! That night, we Cheaps paraded down the block with some tote bags and our stepstool. We picked for about 20 minutes and came home with 11 pounds of cherries. We spent the rest of the evening in the back yard, with Little Cheap pulling off the stems and me pitting the fruit with our semi-broken cherry pitter, which I’d love to replace with a stainless steel version or something like this more automatic tool (the latter claims it would have saved me at least an hour of pitting). 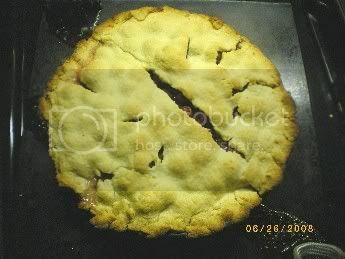 I turned about 10 cups of the cherries into two pies. We ate one for breakfast yesterday and today, and the other one I left on the neighbor’s porch with a thank-you note yesterday afternoon. 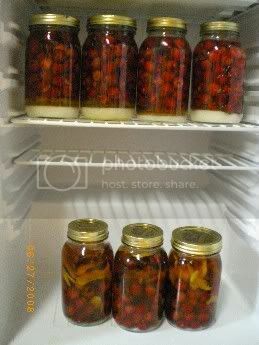 I thought about making preserves with the rest of the cherries, but they are a large, mostly sweet variety (I didn’t even know Bing-type cherries could be grown in Colorado — I’ve only ever seen local sour cherries previously), and I didn’t think the preserves would be the tastiest. Instead, we are turning the other 7 pounds of cherries into two types of cherry liqueur — cherry bounce (made with bourbon and lemon peel) and the Danish cherry liqueur recipe on this site, made with vodka and a dash of bourbon (the recipe calls for brandy, but Mr. Cheap was already buying more liquor than we buy in months, so we didn’t add brandy to the mix). That’s the liqueur at the top, and the bounce at the bottom. Now we must store it in a cool dark place for two to three months. It’s making its home in the old mini-fridge that is still sitting, unplugged, in our laundry room until we decide what to do with it; a normal pantry shelf would work very well. When it is finished, we’ll strain off the liquid and rebottle it, and hopefully have some delicious cordials to enjoy in the fall or give as gifts. Finally, as a small bonus, I saved the stones, washed them and dried them in the sun – they’ll make good pie weights the next time I bake.